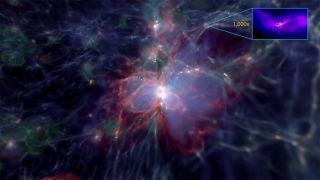 A 30,000-light‐year-wide region from a supercomputer simulation called the Renaissance Simulation centered on a cluster of young galaxies that generate radiation (white) and metals (green) while heating surrounding gas. A dark matter halo just outside this heated region forms three supermassive stars (inset), each of which is over 1,000 times the mass of our sun. These giant stars quickly collapse into massive black holes and, over billions of years, eventually form supermassive black holes. The birth story of the universe's first supermassive black holes is getting a rethink. Researchers have generally thought that the seeds of these pioneering behemoths sprouted in areas awash in ultraviolet radiation streaming from neighbor galaxies. This radiation inhibited the formation of normal stars, freeing up material for eventual incorporation into black holes, the idea goes. "In this study, we have uncovered a totally new mechanism that sparks the formation of massive black holes in particular dark-matter halos," study lead author John Wise, an associate professor in the Center for Relativistic Astrophysics at the Georgia Institute of Technology, said in a statement. "Instead of just considering radiation, we need to look at how quickly the halos grow," Wise added. "We don’t need that much physics to understand it — just how the dark matter is distributed and how gravity will affect that. Forming a massive black hole requires being in a rare region with an intense convergence of matter." A zoom in of the inner 30 light‐years of the dark matter halo. The rotating gaseous disk breaks apart into three clumps that collapse under their own gravity to form supermassive stars. Wise and his colleagues came to this conclusion after analyzing supercomputer simulations of the early universe's evolution. These simulations revealed 10 dark matter halos that harbored only gas clouds, despite being so massive that they should have become stellar nurseries. The researchers then ran additional simulations on two of these halos, each of which was about 2,400 light-years wide, to get a more detailed look at what may have been going on just 270 million years after the universe's birth. "It was only in these overly dense regions of the universe that we saw these black holes forming," Wise said. "The dark matter creates most of the gravity, and then the gas falls into that gravitational potential, where it can form stars or a massive black hole." Black holes were favored where the halos ballooned, their own growth spurred by the mergers of gas clouds that built up the nascent galaxy, the researchers found. "That was the key," study co-author John Regan, a research fellow in the Centre for Astrophysics and Relativity at Dublin City University in Ireland, said in the same statement. "The violent and turbulent nature of the rapid assembly, the violent crashing together of the galaxy’s foundations during the galaxy’s birth, prevented normal star formation and led to perfect conditions for black-hole formation instead." Those conditions result in the formation of just a few supermassive stars rather than lots of smaller, "normal" stars, the new research suggests. Supermassive stars live fast and die young, quickly collapsing into black holes — unlike sun-like stars, which live for billions of years and ultimately end up as dense stellar corpses called white dwarfs. Some of those newborn black holes grow into supermassive behemoths over the eons. And fast-growing dark matter halos have likely been common enough throughout the universe's history to have considerable explanatory power, the study team determined. "We predict that this scenario would happen enough to be the origin of the most massive black holes that are observed, both early in the universe and in galaxies at the present day," study co-author Brian O'Shea, a computational and theoretical astrophysicist at Michigan State University, said in the same statement. The new study was published online today (Jan. 23) in the journal Nature.